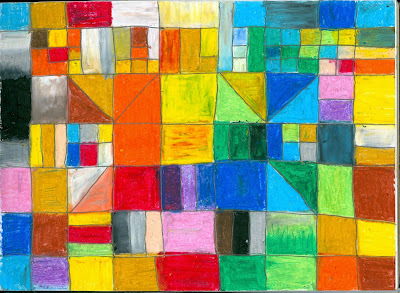 This was done when reading and studying about Paul Klee´s amazing work. I used oil pastel and grafitti. Este exercício foi feito quando lia e estudava sobre o incrível trabalho de Paul Klee. Usei pastel oleoso e grafite. I love that black and gray section in the far left column. It is like a window looking out from the rest. That probably made no sense whatsoever, but I like the depth here. I'm imagining a quilt just like this. It would be extraordinary! Fantastic piece! Paul Klee was amazing. So much fun! Love the pattern. It is so colorful and lively. Good art. Thank you, guys! Raena, Suzanne, Ann and Ramona, I feel like we were mattes! Your words made me very happy! Lovely pattern and colours. Paul Klee was amazing wasn't he! I've enjoyed seeing your artwork! This one is eye-popping with all the color! Thank you for visiting my blog and commenting…I really appreciate it!